For more than two decades Jan Kock and Torben Sode in cooperation with others have been studying relicts of traditional glass making in Europe, Turkey, Syria, Egypt, Israel, and India. 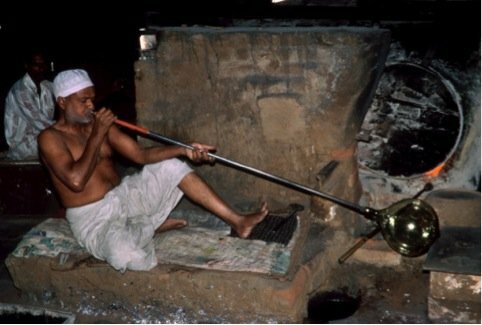 On this tour guided by us we will see some of the highlights of glass production and also of Indian culture in general. We will visit Delhi; Agra; Ferozabad, the biggest glass city in India both with modern and traditional production; Purdilpur and villages around with traditional beads and bangels production; Jaipur with the Maharajah Palace; Ahmedabad with the production of mirrors in Kapadvanji and/or stone cutting industy in Khambhat. See details in the program below. Kock, Jan & Torben Sode: Glass, Glassbeads and Glassmakers in Northern India. Esbjerg 1995. Sode, Torben & Jan Kock: Traditional Raw Glass Production in Northern India: The Final Stage of an Ancient Technology. Journal of Glass Studies v. 43. The Corning Museum of Glass. Corning 2001, p. 155-169. Kock, Jan & and Torben Sode: Medieval Glass Mirrors in Southern Scandinavia and their Technique, as still Practiced in India. Journal of Glass Studies v. 44. The Corning Museum of Glass. Corning 2002, p. 79-94. 1100 Euro in a double room, single room 528 Euro extra pr. Person. The price include hotel, food, all transport in India from the pickup in Delhi Airport and to the airport in Ahmedabad. Beverages are on your own. Number of Participants 18 to 20. Vilhelm Kyhns Alle 2, DK 8270 Højberg, Denmark. Participants will be informed later about when the total costs have to be payed. No insurances and visas are included, travelers must make their own arrangements in due time. Investigate also vaccination regulation. On your own. Book early, there is a big competition. Many companies are flying to India, Finn Air, Lufthansa, Qatar Airways, Emirates and Turkey Airlines are a few examples. Induvidual pick up from the airport. New Delhi - visit at The National Museum and Craft Museum. If there is a demand we will arrange visits in antique shops and galleries. New Delhi guided tour with visit at Red Fort. In the late afternoon we will go by bus to Agra. In the morning visit at Taj Mahal. Lunch in the outdoor Restaurant Riao. In the afternoon sightseeing in Agra and visit at Red Fort. Bus to the glass bead making village Purdilpur. Bus to Ferozabad to visit glass factories. The afternoon in the bangle bazar. Bus to Ferozabad to visit other glass factories. Guided tour in Jaipur incl. visit at City Palace. In the evening a short visit at Pushpendra who makes Indian glass windows and his son who is doing mirror design with Kapadwanji mirrors. Visit at Amber Fort in the early morning. Guided tour in the Bazar and a visit in The antique shop Royal Gem owned by Santi Choushary. Flight from Jaipur to Ahmedabad. Bus to the glass mirror factory in Kapadvanji. We hope they are working. In the late afternoon a short visit at the Tapini Bamboo Development Centre. Whole day trip to Khambhat, the ancient stone cutting city with agates and carnelian making. In the evening visiting at the textile marked in Ahmedabad.